In the early years the grounds were barren with little or no provision for landscaping. Improvements, which began about the time of World War 1 have made the grounds quite beautiful and add to the impressiveness of the building. 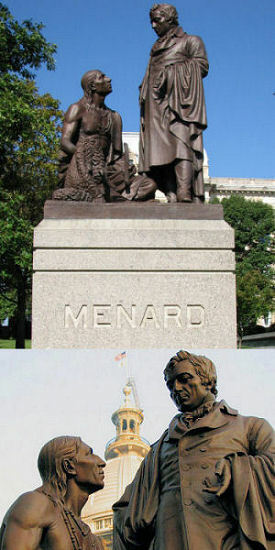 The 8 ft. statue of Pierre Menard, Illinois' second Lt. 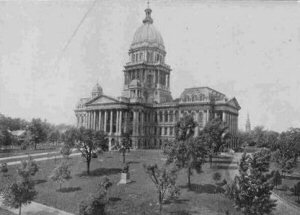 Governor, trading with a Native American was placed on the Capitol lawn on May 28, 1886 and was dedicated on January 10, 1888. It was moved to its present location in 1918 to make room for the Douglas statue. The 10 ft. 6 in. statue of Abraham Lincoln was dedicated on October 5, 1918, the centennial of the first meeting of the Illinois General Assembly. 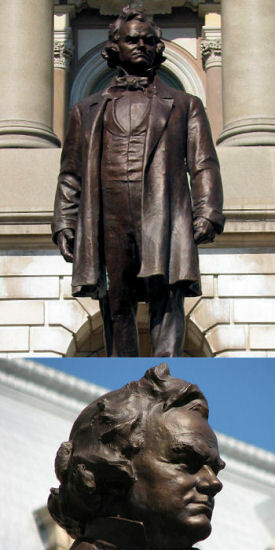 This statue and the statue of Stephen A. Douglas were funded by the same 1913 appropriation. 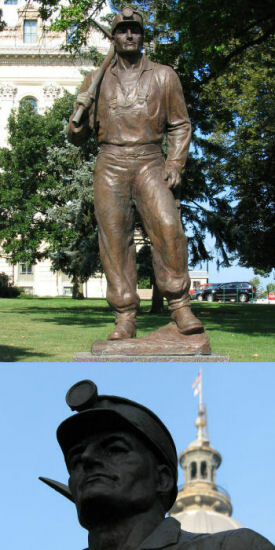 This statue of the "Little Giant" was dedicated on October 5, 1918, the same date as the Lincoln statue. 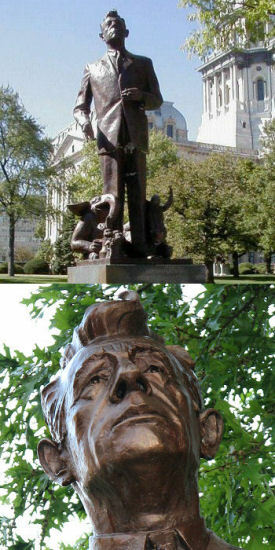 When it was dedicated, the Douglas statue was placed to the north of the Lincoln statue where the Menard statue had been. In 1935 the Douglas statue was moved to its present location, directly in front of the east steps of the Capitol. The Richard Yates statue was dedicated on October 16, 1923 in a joint ceremony along with the Palmer statue. 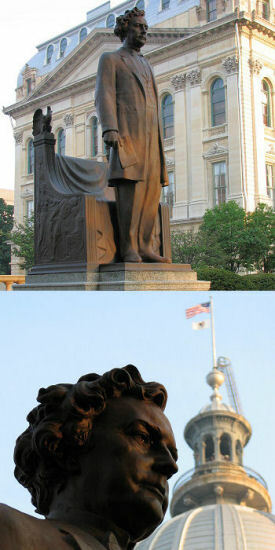 Yates was an Illinois Governor and a Senator. He was known as the "wounded soldier's friend" and was popular among Civil War veterans. 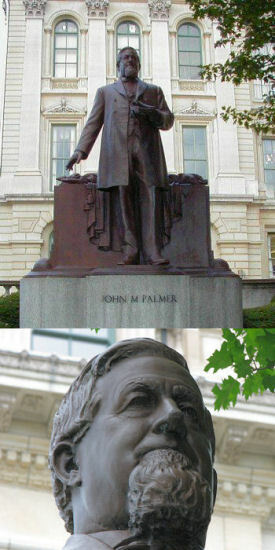 John M. Palmer was a general in the Civil War, military governor of Kentucky, and was elected Governor of Illinois in 1868. He was later elected to the U.S. Senate. The statue was dedicated on October 16, 1923. 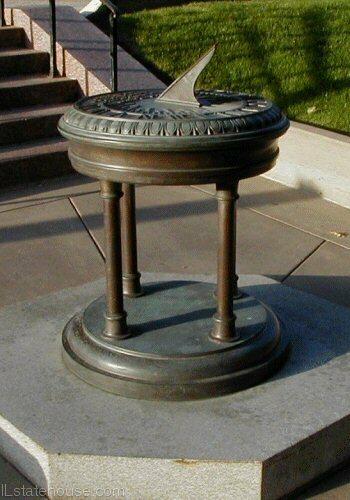 The sundial was donated by the Daughters of Union Veterans of the Civil War and dedicated to the Grand Army of the Republic on September 8, 1940. State Representative Paul Powell introduced a bill to create a monument to honor Illinois coal miners at the urging of miner, poet and artist Vachel Davis. 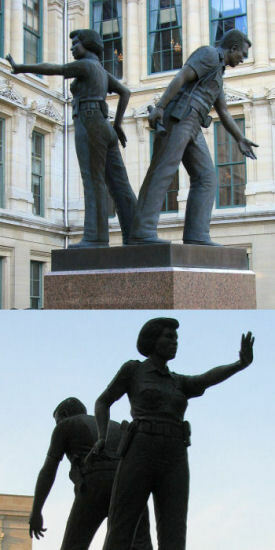 The statue was modeled after Davis' famous painting and dedicated on October 16, 1964. Everett Dirksen served Illinois for 34 years as a Congressman and U.S. Senator. The elephant, donkey, and oil can at his feet represent his skills at fostering cooperation between Republicans and Democrats to enact important legislation. The statue was dedicated on September 16, 1976. 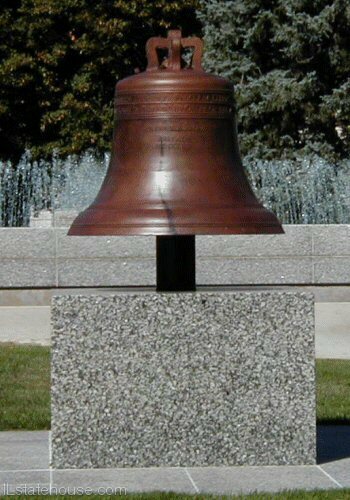 54 replicas of the Liberty Bell were cast in France in 1950 to promote the sale of U.S. Savings Bonds. They were distributed to the states by the U. S. Treasury Department. This bell was abandoned at the State Fairgrounds for 25 years. It was taken out of storage and became part of a bicentennial exhibit that traveled the state in 1976. It was moved to the Capitol grounds on April 28, 1977. 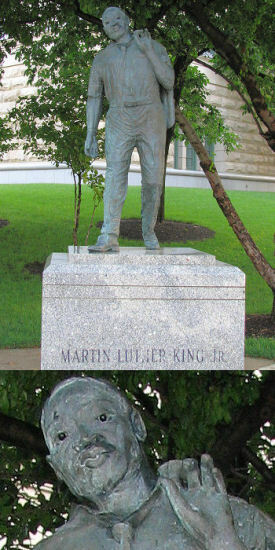 The statue of Dr. King was unveiled on January 14, 1988 and displayed in the Capitol rotunda until it was moved outside the Illinois State Museum in 1989. In 1993 the statue was moved to its present location at "Freedom Corner" across 2nd Street from the Lincoln statue. 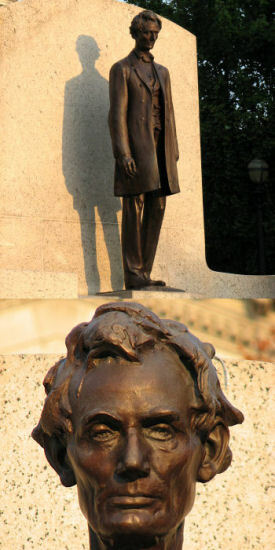 Dr. King is the only non-Illinoisan to be honored with a statue. This memorial was dedicated on October 29, 1990 to honor police officers killed in the line of duty. Each May a ceremony is held to honor officers recently killed performing their duties. Their names are added to the original 643 engraved on the surrounding granite slates. 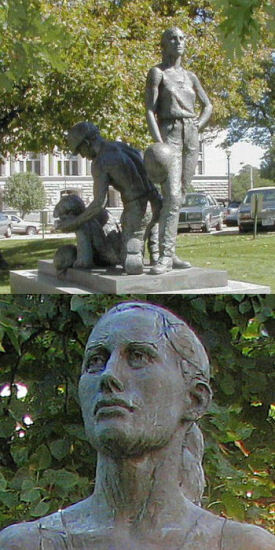 The Workers Memorial was paid for by donations from union members and "is dedicated to the memory of thousands of Illinois workers killed and injured on the job." The statue was dedicated on April 28, 1992 with national AFL-CIO president Lane Kirkland giving the keynote speech. The newest memorial on the Capitol grounds was dedicated on May 13, 1999 "to the firefighters of Illinois who have given their lives in the line of duty and heroically serve with courage, pride and honor." 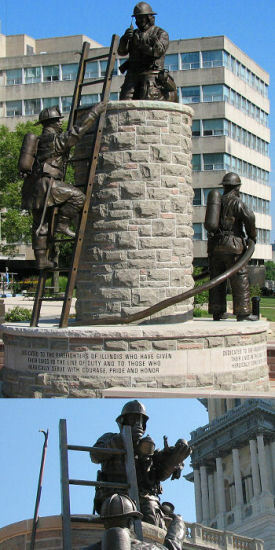 A ceremony is held at the memorial in May honoring Illinois' fallen firefighters.